We are pleased to highlight Hidden Hills Horse Farm, a privately owned equestrian facility nestled on a beautifully manicured 103 acre property within the breathtaking landscape of Frederick, Maryland. Hidden Hills Horse Farm is owned and operated by Art Sagoskin, who with Horse Trainer, Ryan Minor lives on the property. We were pleased to receive Art’s call regarding an audio system for their professional equestrian facility. After exhaustive research, Sagoskin's decision to partner with Equine-Audio for this project was a "no brainer". Art asked the right questions and Equine-Audio had all of the right answers. 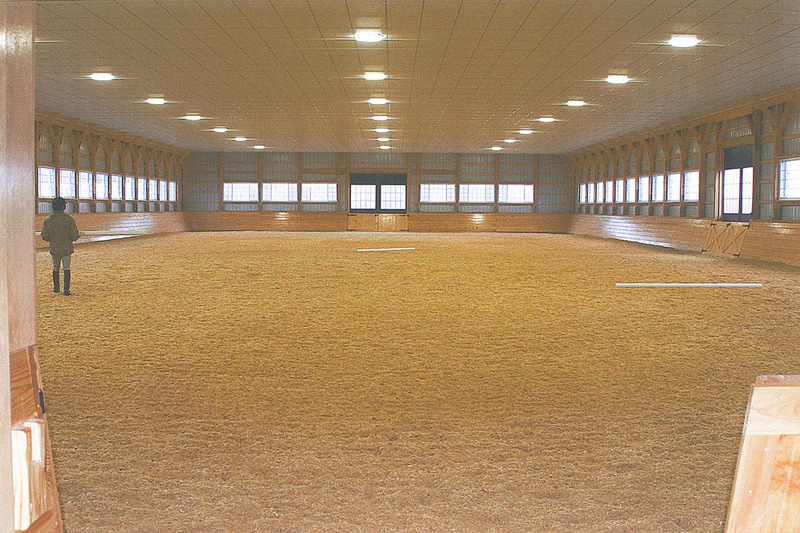 Boasting a new and beautifully constructed 100 x 200' inside arena, complete with a state of the art dustless footing, S&S were looking for a high-quality system to complement their fine arena. Their concerns were similar to those expressed by previous EA customers. They wanted viewers (in the viewing room) to clearly hear what was going on in the arena. They didn't want the system to be too complicated. Most importantly, they wanted it to be safe. The safety of our clients is always a critical factor when installing systems that will be used within this environment. A desirable system is one that will not frighten your equine partners, potentially putting riders, observers, and horses at risk. EA technical staff custom designed a system that achieved the perfect balance that they were looking for. Easy to use and intuitive, anyone with little guidance can operate the system, with little (if any) previous experience using professional audio equipment. All wiring for the system was hidden, such that there are no unsightly wires and no trip hazard present. The workmanship of the arena is worthy of mention, and the sound system blends in nicely, in both the viewing room and arena. Specializing in Hunter/Jumper, Hidden Hills Horse Farm offers boarding, training, lessons, clinics, seminars and horse sales. “The system has been invaluable in facilitating these activities” says Sagoskin. “In addition, we have the ability to play relaxing music while riding and training." "I can't tell you what a joy it was working with a knowledgeable and meticulously precise client that did not want to compromise the integrity of the Hidden Hills sound system" says Barb Paulsen, Project Manager. "The installation was completed smoothly and within the proposed and desired timeframe. Of greater importance, the installation was accomplished to our client's complete satisfaction. Sagoskin's trust in the expertise of the Equine-Audio team and his overall cooperation played a significant role in the project's success." Training on the system was effortless. Again, attributed to a team - which included Hidden Hills trainer, Ryan Minor- that wanted to be completely knowledgeable about their system; and the tireless efforts of Moe Paulsen, VP Sales and Ben Wiersum, Design Engineer, committed to delivering a flawless and user friendly sound system.